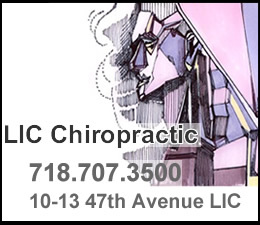 January 15, 2011 / Long Island City / LIC / Queens Buzz. Continued – Use Search function to find story introduction. I arrived at the NY Irish Center just in time to attend a musical performance given to what looked to be a pretty full house. The NY Irish Center had hosted a cocktail hour down in the lower level of the building prior to the show. 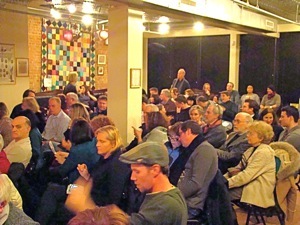 The main floor and theater of the NY Irish Center is shown to your right, just prior to the live music performance. Ashley and Cormac came out onto the stage and introduced themselves. 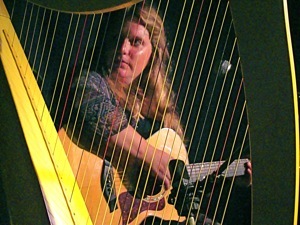 As mentioned in the introduction, harpist Cormac De Barra hails from Ireland, while singer, songwriter and guitarist Ashley Davis hails from Kansas. The first song they performed was a Gaelic ballad related to Grafton Street which I believe was written by Ashley. Her alto-soprano voice filled the room, while the vibrating the strings of Cormac's Irish harp resonated in accompaniment. As I watched and listened it dawned on me that the shape of the harp resembles the piano soundboard. After the performance I did a bit of research and found that the predecessor to the Irish harp was the lye which comes from ancient Greece. 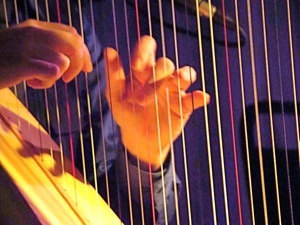 And it appears that the harp was the predecessor to the piano which originated less than three hundred years ago. Not far into the set, Ashley sang a melodious tune that sounded familiar to me. The audience seemed to know it well, and many sang along. 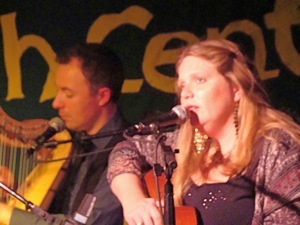 This was a traditional Irish song, of which about half of Ashley’s and Cormac’s performance was comprised. The other half included mostly original works that they had created; all containing an Irish influence. Ashley had gone to school in Limerick Ireland where she immersed herself in Irish culture to the point where she could sing Gaelic songs. She sang a old Gaelic tune about a mother’s goodbye to her son as he went out to sea, never to be seen again. Apparently there was a time when this was a common occurrence, as the Irish fished the bounty of the north Atlantic Ocean for millennia and its fierce storms are often deadly. Cormac did a couple of solo performances on the harp. One was a collection of tunes from a 18th century harpist named Turlough Carolan. O’carolan, as he is frequently called, was a composer / harpist toward the end of the golden age of the Irish harp. The use of the Irish harp, long a symbol of Gaelic culture began declining in the early 19th century. The harp has been identified as a symbol of Irish culture for the past 500 to 1,000 years. It seems no coincidence that the piano was invented right around the beginning of the decline of the Irish harp. The piano was first invented in Europe by Bartolo Cristofori in 1711, and is based on a triangular soundboard that is very similar to the structure of the Irish harp. The piano was the new technology, replacing the itinerant harp with a more robust versatile sound. But the tradeoff was that the piano is a stationary instrument. 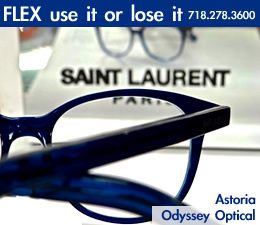 Click here to learn more about the role of Queens NY in piano making and the Steinway Mansion in Astoria. While the Irish are known for their tragedies, they’re also known for their humor. Cormac found a traditional Irish tune that he wanted to play at Ashley's wedding. It was a heavenly song, with a great deal of resemblance to the kind of music one would expect to hear at a beautiful wedding. However in introducing the piece, Ashley informed us that the harpist who had composed it, did it in honor of his drinking buddies. There were a number of other songs, most of which included introductions that harked back to Irish culture. Ashley was asked by her brother to play a song with a traditional Irish theme at his wedding. Ashley inquired, "Which traditional Irish theme would you prefer: famines, drinking tales, destitution, broken hearts or blessings?" They decided to go with the blessings. One of the last songs turned out to be my favorite. I believe it was entitled This I Do. It was about the fire of youth, fleeting friends and the winding journey of life. It was deep and soulful tune ... as Ashley's voice penetrated the quiet crevices of my heart, loosening emotions once buried, gently releasing them into the ether. Her voice has a range and versatility, which she used to full effect. The night was one of Irish song and culture. The musical performance was as culturally stimulating as it was relaxing. It recalled the history of Ireland and the Irish way of life. The crowd was fully engaged and while many were of Irish descent, there were also many Americans of pan European as well as of Asian descent. I had the opportunity to catch up with Paul Finnegan Executive Director of the New York Irish Center after the show. He informed me that there won’t be any new cultural programs offerred until the Spring / Summer months as new construction is about to begin. 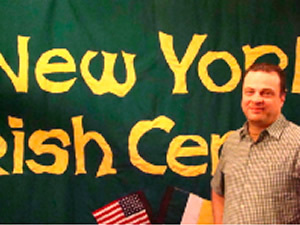 A while back I had interviewed Paul who provided me with some background on the NY Irish Center. Paul is shown in the photo to the right which was taken in the Spring of 2010. 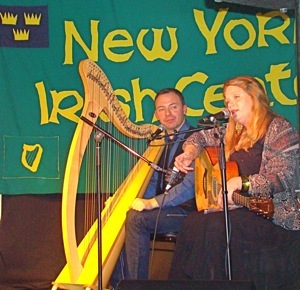 The NY Irish Center provides a variety of Irish cultural programs such as: dance classes on Mondays, Gaelic language classes on Tuesdays, senior lunches on Wednesdays, children’s baking classes [learn how to make Irish bread and scones] and computer training classes for seniors on Saturday mornings. Paul has also enlisted the services of Chris Deignan as a Programs and Events Manager to help him develop the NY Irish Center’s cultural offerings [Chris is shown in the slide show - DSC01882a]. For example dance, music, theater and readings have been performed over the past year. And as previously mentioned, following the construction these cultural programs are expected to resume. Erin Go Bragh. 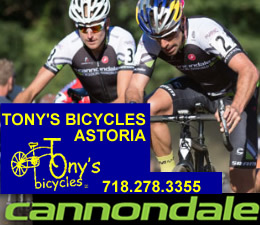 Click here to view the business listing to the New York Irish Center, including a link to their website. Click here to view a map showing the location of the NY Irish Center in Queens. 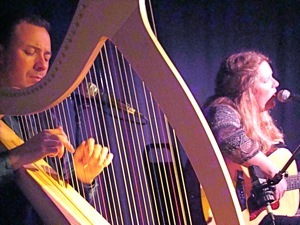 Click here to go directly to the album containing photos of singer Ashley Davis and Irish harpist Cormac De Barra performing. Click the double arrows to flip through the show at your own pace. 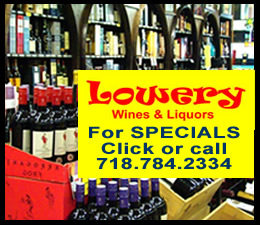 Click this link to go to the LIC - Long Island City / LIC - Long Island City Restaurants / LIC - Long Island City Shopping Center & Map. 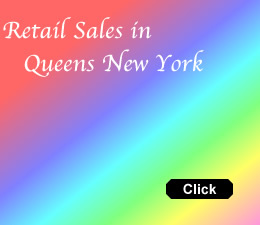 Click here to go to the Queens Real Estate section of the site. 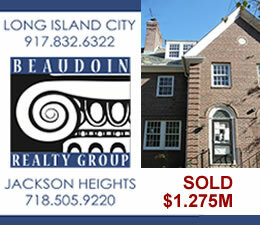 Click here to go to the home page of Halvatzis Realty for real estate In Astoria, MPC Properties for real estate in Jackson Heights and Welcome Home for real estate in Sunnyside. 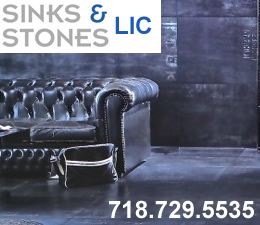 Click here to go to the home page of Ponce De Leon Bank for Mortgages In Long Island City, Astoria & Queens. 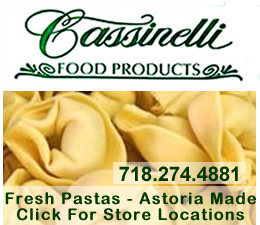 Click here to go to the home page of an Allstate insurance agency for Home Insurance In Long Island City, Astoria & Queens.